New Year is the biggest holiday of the year in Asian countries, much like Christmas is for many families in the western hemisphere. It’s a weeklong festival full of rich and interesting traditions. Why doesn’t it fall on January 1? The Chinese New Year (also called the Lunar New Year) is based on a calendar that was in use long before the Gregorian calendar—today’s global standard—was even created. The lunar calendar follows phases of the moon instead of the sun, and its New Year falls “two dark moons after the winter solstice,” or around the end of January. Each year in the Chinese zodiac is symbolized by a different animal with different characteristics. Each Chinese New Year is symbolized by an animal that embodies specific traits and characteristics, giving it special meaning. 2014 is the Year of the Horse, which symbolizes hard work, independence and adventure—all important values to instill in your kids. China has many varied New Year traditions, each with a special meaning and role in the overall holiday celebration. In most families, adult children go to their parents’ or in-laws’ homes to spend New Year’s Eve together. Here are a few of those traditions, and some ways you can celebrate with your family. Firecrackers are the most important part of the Chinese New Year celebration. They are believed to scare away any spirits living in the house, making the home clean and pure for the coming year. And they must be set off before the celebratory meal that is the central feature of the New Year holiday. One strand of firecrackers must be set off before the big meal; traditionally this job falls to the oldest adult son in the family. Fireworks are a huge part of the festival, with people setting them off at all hours of the day and night for the whole seven days of the holiday. One of about half a dozen fireworks that went off within two minutes! Many large cities have banned firecrackers and fireworks, so the atmosphere is livelier in smaller towns and villages where fewer regulations are in place. Beijing’s fireworks mark the Chinese new year. A big, loud display of fireworks or firecrackers would probably be frowned upon where you live, too, so to celebrate this aspect of Chinese New Year, you and your kids can make some Chinese firecracker decorations. 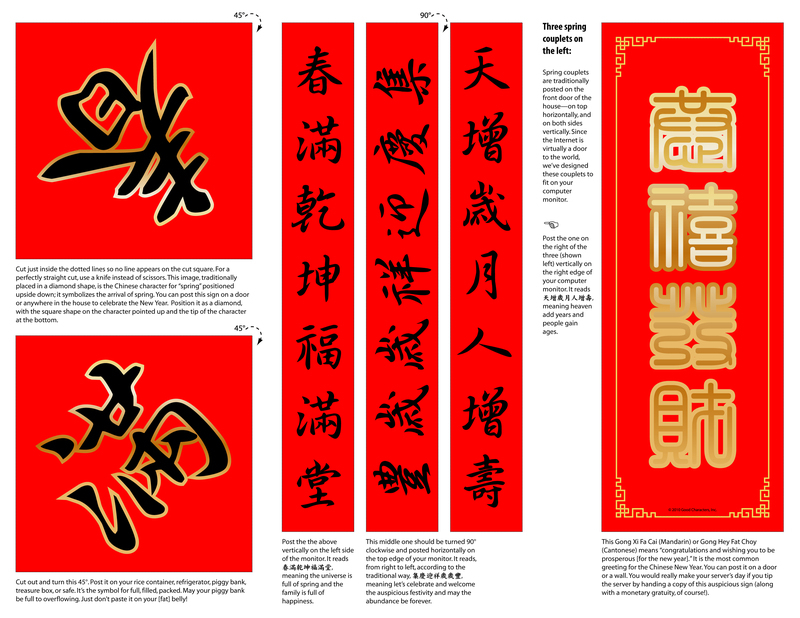 Families hang couplets or “chun lian” (two lines of poetry that rhyme) outside their doors to bring luck to the family and all who enter the home. Like the firecrackers, these are hung outside the home’s entrance before the large New Year’s meal. Couplets are red banners that include two verses of poetry. One is hung to the left of your front door and the other on the right. There’s also a four-character (four-word) scroll to hang across the top. This new couplet is said to bring good luck to all who enter the home. The Chinese language is written in characters, not letters. One character represents a whole word rather than a sound, like a letter does. They are traditionally written from top to bottom instead of left to right. That’s why the couplet banners are vertical. Couplets are often hand-written by older people who sell them before the holidays. Print a mini couplet to hang at your front door. Image source: goodcharacters.com. Here’s a couplet that you can print and hang on your front door to celebrate Chinese New Year. Large meals bring families together for Chinese New Year just as they do for holidays in many cultures. And I do mean a large meal. Most families gather for lunch or dinner and share a meal with at least a dozen dishes, but probably many, many more! This is just the first set of plates for the big meal on Chinese New Year’s Eve—there were 25 in all! Later in the evening on New Year’s Eve, families start making and eating dumplings (Jiaozi), while watching a televised gala as they wait to ring in the New Year at midnight with fireworks. While millions of families make dumplings, many more do not. Depending on which part of the country they’re from, they may make steamed bread, steamed buns or spring rolls instead. As they watch the latest comedy sketches and listen to stars perform their latest hits, the whole family pitches in to make dozens of dumplings long into the night. From chopping the veggies and stirring up the filling ingredients to kneading the dough and rolling out the wrappers, everyone is assigned a task and dozens of dumplings are created and consumed over the course of the evening. Working together to pass on traditions and learn new skills while making memories. Learning to cook new foods, like dumplings, that are popular in other countries is a great way to expand your kids’ palates and teach them about different cultures and customs. Follow the instructions below to make traditional dumplings for your Chinese New Year celebration. When the festivities wind down, somewhere between 12:01 and 2:00 am, the family heads to bed—only to wake up by about 7:00 am so they can go out to visit friends and relatives, hand out red envelopes (hong bao) to the children and wish their friends and neighbors a happy New Year. Red envelopes are small paper envelopes decorated with Chinese characters and pictures that represent fortune, and are given to children younger than 18. Money is placed inside, anywhere from 100 to 1000 yuan (about $16-160) or more. Traditionally, children were required to bow down to their parents, grandparents, aunts and uncles before they received the red envelopes. Unlike in many Western cultures, Chinese kids aren’t required to write thank-you notes to the people who give them money; however, their parents are obligated to give an equal amount to the children of the people who gave red envelopes to their child! Excited about all the pretty money that he got from family and friends! You and your kids can say “Wishing you a prosperous New Year,” (Gong Xi Fa Cai in Mandarin; Gong Hey Fat Choy in Cantonese). Then you can write the Chinese characters on an envelope and fill it with money to give your kids. Here’s a list of ingredients and supplies you’ll need to create a batch of dumplings for your family to try. Chinese dumplings are a delicious hearty meal and a creative way to disguise vegetables. Since dumplings are easy to make, they’re a great cooking activity for you and your children. I’ll show you how to create homemade pork and cabbage dumplings, plus a sweet and sour vinegar dipping sauce. Packed with meat and vegetables, these are a complete meal the whole family can enjoy as you celebrate the Lunar New Year. Depending on how much time you have, you can gather the ingredients, wash and cut them yourself or let the kids pitch in. If the ingredients need to be chopped—like the cabbage, scallions, garlic and ginger—have your child wash them, then you can do the chopping. Measure the ingredients and place in bowls in advance to save time. It helps if you put most of the ingredients in bowls as you chop and measure them. Tip: Since the sauce uses several of the same ingredients as the dumpling filling, it’s easiest to chop and measure the ingredients for both at the same time. The filling ingredients ready to be made into dumplings. Wash and cut the cabbage, onion, garlic and ginger, being sure to chop it quite finely. This is probably an “adult” task, but an older child who is experienced in cutting could do this with supervision. Wash the cabbage well, and tear it into small pieces before cutting. Measure the cabbage. If you’ve got a little extra, just include it. If you have more than a little, set it aside for use in your next meal (it will give your soups and casseroles a wonderful nutrition boost). To make the filling, put all of the ingredients except the dumpling wrappers in a bowl and stir together. Stirring is a great task for even the youngest helpers. Make sure all of the meat is mixed in evenly with the other ingredients. Use a bowl bigger than you really need to help ensure the filling stays inside when little hands are stirring! First, place the sugar, garlic, scallions and chili flakes in a bowl. Add the soy sauce, rice vinegar and sesame oil and stir. Set the sauce aside to serve with the cooked dumplings. Stir the sauce slowly to avoid spills. This is a great opportunity to instill in kids the habit of cleaning up after themselves. Keep a rag handy during the prep and cooking process and you’ll be amazed at how the kids clean up their spills. Tip: Pour liquids over a separate bowl in case small, unstable hands make a mistake and pour too much! Now that the filling is ready and the sauce is done, it’s time to dig in and start making the dumplings! Flour your cutting board or other flat surface so the dumplings don’t stick to it or each other while you’re filling them. Use a small spoon to avoid overfilling. Put a dumpling wrapper on the flour, then spoon about 2 teaspoons of the filling in the center of the wrapper. Fold the wrapper in half, pinching the edges together tightly so the filling doesn’t fall out during the cooking process. Pinch the edges together tightly! Fill about a dozen wrappers (or all of them!) before you start to cook them. Dumplings just waiting to be cooked! Cooking goes much faster than the filling process. You’re just minutes away from tasting your dumplings! Fill a large pan or wok about half-full of water and bring it to a boil over a medium heat. Once it’s boiling, place 10-12 dumplings in the pan. Don’t put too many in or they won’t cook well. The water will stop boiling when you add the dumplings, but that’s OK. The water will stop boiling once you place the dumplings in the pot. When the water starts boiling again, add about a cup of cold water to the pot. The water will stop boiling, but leave the flame as it is. When the water comes to a boil again, add another cup of water. The water is boiling—now it’s time to add some cold water. When the water comes to a boil for the third time, the dumplings are ready. Drain the water well to prevent them from becoming soggy. Use a slotted spoon to remove the dumplings from the pot, or spoon them into a strainer to allow the excess water to drain off. Put the drained dumplings on a plate and cook the next batch. Repeat this process until all the dumplings are cooked. Now it’s time to dig in and enjoy the fruits of your labor. Give everyone a small dish of the dipping sauce and a plate of dumplings, then watch them disappear. Dumplings are such a versatile food; pork and cabbage are just one of the popular fillings. Other flavorful fillings include tomato and egg; carrots and pork; shrimp and pork; and mutton and cabbage. Really, the options are endless! If you think you won’t be able to eat all of the dumplings, you can place them on a parchment paper-lined baking sheet and freeze them. Once frozen solid, put them in an airtight container and store in the freezer for up to three months. When you’re ready to eat them, just cook using the same method described above. Chinese New Year sounds pretty fun, right? Since it’s probably too late to make a trip to celebrate in the nearest Chinatown, you can make your own decorative firecrackers, print out or write a couplet-like message for the New Year, deliver red money envelopes to all of your favorite kids and cook up some dumplings together. What do you think? Has your family ever cooked ethnic foods that are new to you? Or has your family done anything to celebrate a holiday that you don’t ordinarily celebrate? I hope you’ll give this recipe a try and let us know about your success in the comments below! Thanks, Charlotte! It’s so interesting to learn about other cultures and so important to expose the kids to them. Can’t wait to try the dumplings and other Chinese New Year activities this weekend. This looks fun! My kids just had an intro to the Chinese new year at a pyjama party they attended, so these ideas would help solidify that knowledge. I love #2!! Yes, do try them! They are really delicious; and you can swap different kinds of meat and veggies if you don’t like pork and cabbage. How neat! As a kid we never had themed parties like that; I’ll have to keep that in mind for when my kids are older. Haha! I know, right? Everything has “stepped up” a bit since when we were kids. You should try this with your grandkids! The sauce was new to me, but a step up from the normal dish of vinegar/soy sauce/chili oil/garlic paste that they have in the dumpling shops here. My boys are in a Mandarin Immersion school, so this would be a great extension to their learning. And fun! Thanks. That is awesome! I’m sure they’ll love these, and once they know how to make dumplings, along with speaking Mandarin, they’ll be a huge hit with their Chinese friends.